Welcome back to Hopeless, Dear Reader! 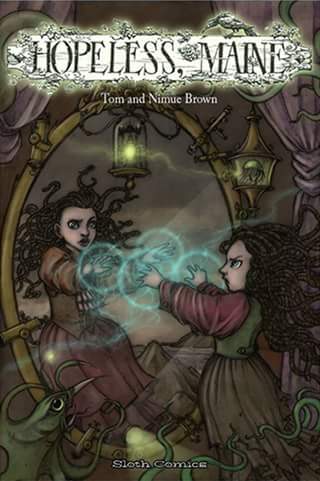 This, my third installment about the brilliance of Nimue and Tom Brown, is part of a blog tour to celebrate the release of Hopeless, Maine – The Gathering. So hop on and get a glimpse of what Hopeless has to offer! Residents of the island Hopeless Maine call these creatures ‘creepy and annoying’ when they notice them at all. Agents of Change is more a description of what they are, than anything they’ve ever had said to their ominous absence of faces. The Agents tend to gather in flocks, and mob other life forms. They don’t kill their victims, but anything in contact with them will be affected in some way. They may be the cause of the island’s many oddities. Cooking instructions: Don’t. Cooking does not cause them to cease being agents of change, you really don’t want to risk what that might do to your innards. A popular ingredient in food for unloved relatives. I just received word yesterday that my copy is on it’s way, and with a bit of luck I will be spending Christmas on the island of Hopeless this year! Hopeless, Maine – The Gathering! “Welcome to Hopeless, Maine. An island steeped in evil—I mean—steeped in history. Sal faces the normal, everyday struggles of growing up in a small town—avoiding fell creatures of the night, trying not to get eaten by the aquatic fauna and mastering her supernatural powers. Like all young people, Sal can’t wait to get out of her dead-end home. If she doesn’t get out she probably will wind up dead, after all. Or why not pop over to your local comics store and ask for it? If they do not already have it in stock (they should, and be sure to tell them so) I am sure they can order it for you! Now excuse me while I go off to secure a copy for myself! There’s a new Urban Fantasy book series out, bringing the myth of King Arthur into the modern day. This is a very ambitious project, involving a whole group of excellent authors – including a few of my personal favourites. Three years ago, Jessie “the Berserker” Noble was at the top of the MMA fight game, a world-title contender with a brilliant future ahead of her. Then the visions started and her world came crashing down. Hard. Now Jessie’s a shadow of her former self, taking no-holds barred fights in the underground circuit to earn just enough to buy the drugs she needs to keep the horrible things she sees at bay. When a man named Dante Grimm tells her she’s the modern incarnation of a champion of old and that she and her soon-to-be companions are desperately needed to hold back the darkness to come, Jessie thinks he’s as insane as she is. But Grimm’s far from crazy. There is a battle coming the likes of which the world hasn’t seen in centuries, a battle against a foe straight out of their worst nightmares. And for them to succeed, Jessie going to have to dive deep into the heart of the very thing she’s been running from all this time – her visions. Arthurian myth meets urban fantasy in this new series from Rowan Casey! Twelve New York Times, USA Today, and Amazon bestselling authors – Lilith Saintcrow, CJ Lyons, Joseph Nassise, Steven Savile, Annie Bellet, Jon F. Merz, Pippa DaCosta, Robert Greenberger, William Meikle, Steve Lockley, Hank Schwaeble, and Nathan Meyer – have come together under the pen name of Rowan Casey to create a modern re-imagining of the legend of King Arthur and the Knights of the Round Table sure to please fans of urban fantasy and Arthurian legends alike! Launching in November 2016, the Veil Knights urban fantasy series will be published under the pseudonym Rowan Casey and will feature a new volume detailing the exploits of one of the knights every month through summer 2017, when season one of the series comes to its stunning conclusion. Book two, Hound of Night, will be out next week on Nov 29th. Book three, Cloak of Fury, will be out on Dec 13th. After that, they will be putting out a new book every month! Each eBook will debut at $0.99 for a full week and then jump up to its regular price, so you’ll want to get them early to grab the best deal. Paperback editions will follow in just a few more weeks. This week I’m sharing collection of useful books, recommended by various freelancers in several different fields (including the talented illustrator and graphic designer Stefan Lindblad). Happy Valentine’s Day, Dear Reader! I hope you have someone to celebrate the day with, be it a friend, lover, spouse or perhaps a new interest. Valentine’s day can be full of pressure and expectation, but it doesn’t have to be that way – we can celebrate our love for each other with just a short message of appreciation. Two years ago I was single and not really dating anyone, so instead I wrote a Valentine’s letter each to three friends who had meant a lot to me during the past year, telling them how much I appreciated having them in my life and how they had improved things for me. Today I encourage all of you out there to write to a friend or loved one and tell them what they mean to you. One of those friends has since become so much more to me. What started out as a deep and intimate platonic friendship slowly grew to something more, and since about a month we are living together. Every twist and turn along the way has strengthened our bond, and I can not even imagine a future without her in my life. She means the world to me, and I fall in love all over again every time I see her smile. I choose her, always – moment after moment, day after day. It’s back to the Observer again for this week’s reblog, Dear Reader – this time from the fingertips of Benjamin Hardy. With Lent on the door step, I thought an article about fasting would be approperiate. Now, while I can’t personally attest to the correctness of his claims in this article, intermittent short term fasting is something that has come naturally to me over the years. At first I did it without really thinking about it or realizing I did – though I’ve done it intentionally from time to time as well – and from my limited experience it seems to have beneficial effects. In any case, I found the article interesting and I plan to make a more conscious ritual out of it and see if I get any results.